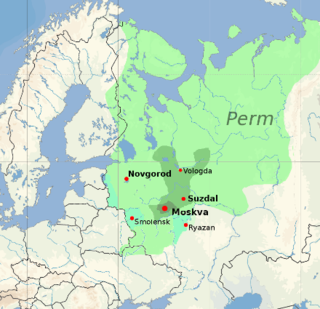 The Pechenegs or Patzinaks were a semi-nomadic Turkic people from Central Asia speaking the Pecheneg language which belonged to the Oghuz branch of Turkic language family. Tmutarakan was a medieval Kievan Rus' principality and trading town that controlled the Cimmerian Bosporus, the passage from the Black Sea to the Sea of Azov, between the late 10th and 11th centuries. Its site was the ancient Greek colony of Hermonassa founded in the mid 6th century BCE, situated on the Taman peninsula, in the present-day Krasnodar Krai of Russia, roughly opposite Kerch. The Khazar fortress of Tamantarkhan was built on the site in the 7th century, and became known as Tmutarakan when it came under Kievan Rus control. The Battle of Dorostopol was fought in 971 between the Byzantine Empire and forces of Kievan Rus'. The Byzantines, led by John I Tzimisces, were victorious. Berezan is an island in the Black Sea at the entrance of the Dnieper-Bug Estuary, Ochakiv Raion, Mykolaiv Oblast, Ukraine. It is often being confused with the artificial island of Pervomaisky that is located within Dnieper-Bug Estuary. The Berezan island measures approximately 900 metres in length by 320 metres in width. It is separated from the mainland by about a mile and a half of shallow water. The Rus'–Byzantine War of 907 is associated in the Primary Chronicle with the name of Oleg of Novgorod. The chronicle implies that it was the most successful military operation of the Kievan Rus' against the Byzantine Empire. Paradoxically, Greek sources do not mention it at all. 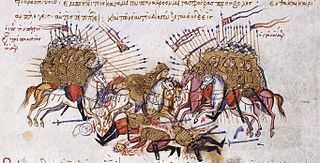 This is a list of the wars or external conflicts fought during the history of the Eastern Roman or Byzantine Empire (395–1453). 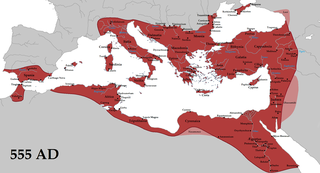 For internal conflicts see the list of Byzantine revolts and civil wars. Sviatoslav's invasion of Bulgaria refers to a conflict beginning in 967/968 and ending in 971, carried out in the eastern Balkans, and involving the Kievan Rus', Bulgaria, and the Byzantine Empire. The Byzantines encouraged the Rus' ruler Sviatoslav to attack Bulgaria, leading to the defeat of the Bulgarian forces and the occupation of the northern and north-eastern part of the country by the Rus' for the following two years. The allies then turned against each other, and the ensuing military confrontation ended with a Byzantine victory. The Rus' withdrew and eastern Bulgaria was incorporated into the Byzantine Empire.